I don’t have a whole lot of gaming time since I started back to work. I am sometimes exceedingly sad about this. At other times, I find it liberating. I’ve gotten in the habit of dabbling in games. I try this, try that, but am not really settling on anything in particular. I finished Fable 3. I am in the last chapter set for LA Noire. Dragon Age 2 is gathering dust. What a disappointing game. I am never going to come close to finishing Final Fantasy 13. EVER. I still need to pre order SWTOR. I am dragging my feet on it because I am still miffed about the $150 bucks they want me to lay out for the Collector’s Edition. I’ll end up buying it. My procrastination proves little other than a quirk in my inner monologue. With my few hours of play time, I want to make sure I am enjoying myself. I want fun. I want bang for my buck. I want it all. 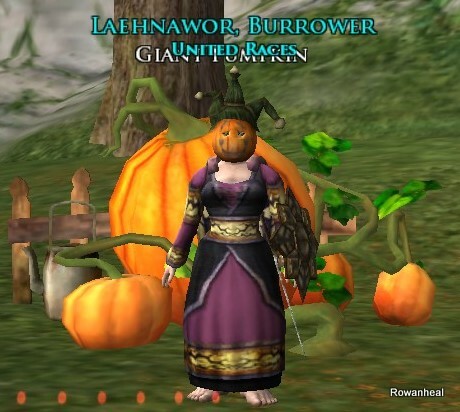 This week the Fall Festival in LOTRO is proving to be a delicious gift to the LORO community touching on all my feel good places! How cute am I? I have been working my tail off to garner as many of the festival goodies as I can. I can’t help myself. 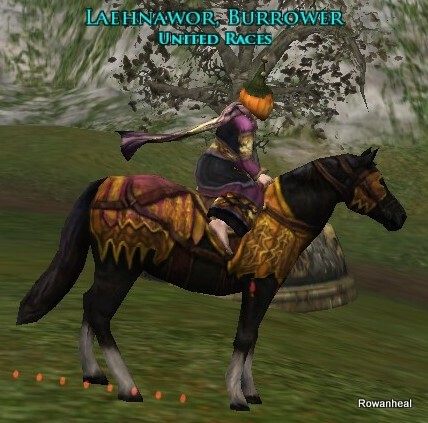 In all seriousness, if you only have time for one festival in LOTRO, make it this one. The Haunted Barrow dished out scares and giggles your first time through. Take the hand of a beautiful companion and enjoy all the thrills and chills. Huge kudos to Turbine! If you need a good guide to the festival, head over to A Casual Stroll to Mordor. They always get the goods early, and make sure to put up pictures, maps and written material to help you through. I don’t know how they have time for it all, but I adore them for doing it! It’s my favorite time of the year. Beautiful fall color, crisp breezes, pumpkin scents wafting from the pie in my oven. Some people love Spring and new beginnings. I love Autumn and the chance to let go as the cycle winds down. Whatever your leanings, I hope you are given the chance to drill down to find those experiences that fill you up. Games are meant to be stress relievers. I say this a couple of times a year as a reminder to those who take in game angst to dramatic heights. Find your fun. *raises a glass as a toast* Get to it!